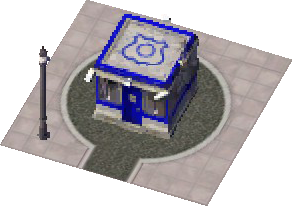 The Police Kiosk is a Civic Building that provides Police Protection for your Sims that was added in the Rush Hour Expansion Pack. The Police Kiosk reduces crime by a variable amount dependent on its funding over a fixed radius up until there are no more unused jail cells in the city. The Police Kiosk is the second least expensive and the least effective Crime-fighting solution in SimCity 4 Rush Hour/Deluxe. It has the lowest monthly cost of all police buildings except the Federal Prison, however it requires either a larger police station or a jail in the city to provide any kind of police protection in its pathetically small radius due to it having no Jail Cells or dispatchable vehicles. It is the bottom of the Police Protection ladder, positioned below the Small Police Station in Crime-fighting power and facilities. The Small Police Station has a much larger coverage area, dispatchable vehicles and at least some Jail Cells, so most Mayors just don't bother with the Police Kiosk. It exists? It's actually pretty pointless to be honest, the Small Police Station is better in almost every way. It produces power. Just enough so that it contributes what it draws. This page was last modified on 5 February 2014, at 14:57.